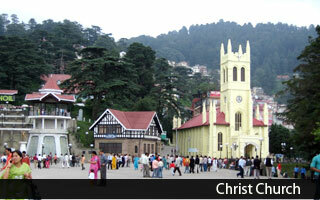 Shimla is India's most popular hill station retreat offering glimpses of the England in the spirit of the town. Himachal's charming destination, Shimla is a preferred summer retreat for tourists who want to experience the highness of Himalayas and remnant traces of the British Raj in the form of churches, Viceregal Lodge, Mountain Himalayan Toy Train from Kalka to Shimla, etc. Set at an altitude of 2213 metres, this city is the capital of Himachal Pradesh. Located near the mall, Christ Church is the famous landmark of the valley. Built in Neo Gothic style, Christ Church is the second oldest church in the North India. Built in 1846-1857, this elegant church contains Rajera memorials and some fine stained glass art. Built as an official residence for the British Viceroys, the Viceregal Lodge is an iconic landmark of Shimla. A fine specimen of colonial architecture, this lodge post independence became a retreat of the Indian President. Currently, this colonial building serves as internationally renowned institute premises of the Indian Institute of Advanced Study. Opposite this iconic building is the Himalayan Bird Park, a small bird sanctuary featuring exotic pheasant and iridescent monal pheasant, the state bird of Himachal Pradesh. Located at 2,445 m altitude, Jakhoo Hill is undoubtedly Shimla's highest point and one of the most scenic locales in Shimla. From the tip of the hill, tourists can enjoy vistas of Himalayan bounties present in Shimla and its surroundings. Colloquially, this tip is known for its old Hanuman Temple where one will unsurprisingly find hordes of monkeys nearby temple area. The Mall is the bustling attraction of Shimla. This main street of the city has a number of showrooms, department stores, restaurants, cafes and shops, making it a bustling city center. Here, tourist can splurge over their shopping spree by obtaining Himachali handicraft items like locally designed woollen cloths, branded cloths, pottery items, and jewellery, etc. 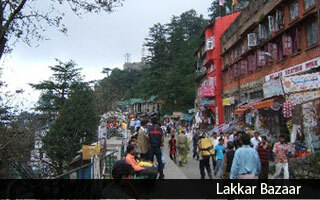 The Lakkar Bazaar or wooden market is known for its wooden toys that can be sourced out in Shimla. Chadwick Falls, 7 km from Shimla is a cascading glory of this hill station. These rain-fed falls of the incredible landscape provide the scenic relief for the tourists. Also, pilgrims can visit some old shrines near Chadwick to gain spiritual relief. Himachal State Museum houses a great collection of Kangra and Mughal miniatures, Chamba embroidery, coins and jewellery, temple carvings, paintings of Shimla and weapons including some massive blunderbusses. The museum remains closed on Mondays and public holidays. By Air – Through Jubbarhatti Airport, tourists can venture inside Shimla. By Road – From Delhi, it takes 10 hours and from Manali, it takes 9 hours to reach summer hill station of Shimla. By Railways - Shimla is connected by narrow gauge, on which runs the famous Mountain Railway or Toy train, through the town of Kalka. The train passes through a series of 103 tunnels, lending it a charm. Climate of Shimla – Climate of Shimla is predominantly cool. During summers, it becomes a tourist summer retreat whereas in winters, it dons the role of a chilled hill station. 13 km ahead of Shimla is Mashobra, the village known for its apple orchards. The forested village is also known for some excellent picnic spots amidst forests of oak and pine. Tourists can enjoy walking or trekking in Mashobra. 16 km away from Shimla is a small hill station, Kufri known for its adventurous excursions. A number of adventure excursions like trekking and skiing can be enjoyed here. Besides this, tourists can enjoy visiting Himalayan Nature Park, to have a glimpse of bountiful Himalayan flora and fauna. Fagu village, 22 km from Shimla is a great option for those who want to cherish the views of the range, including vivid gorges, snow clad peaks and apple orchards. The countryside beauty of Fagu is known for its fruit gardens and nearby terraced fields. 23 km ahead of Shimla is Naldehra, the picturesque valley known for a 9 hole golf course, especially designed by Lord Curson. This small hill station is one of the popular excursions from Shimla famous for the highest cricket ground in the world. The site of Chail is also known for its commanding views and the forests near Chail serve as a home to many species of birds and deer. This town in Solan district is also another colonial hill station established by the British Raj in 1842.